An incisional hernia (also called a Ventral Hernia) is hernia that forms through the scar of an incision from some previous operation on your abdomen (tummy). Cuts through the muscles and fascia (the tough, fibrous coverings of the muscles) of the abdominal wall heal by the formation of scar tissue. But, defects or “holes” can develop in the scar tissue. Bowel and fat from within your abdomen can protrude out through these defects, and lead to an incisional hernia. What is the cause for an incisional hernia? Incisions or cuts on the abdominal (tummy) wall heal by the formation of scar tissue. Because scar tissue is weaker than muscles and fascia, any cut on the abdominal wall carries a risk for incisional hernia. The extent of the risk depends on many factors. For example, risk is very small (about 1 in 100) from a keyhole cut for a routine operation, such as removal of the gallbladder by laparoscopy. On the other hand, the risk can be quite high if a long incision is needed, and your have infection or other medical problems that impair healing. Usually, no special tests are needed to diagnose an incisional hernia. Your doctor may make the diagnosis simply by examining the swelling on your abdomen. But sometimes, the diagnosis may not be clear by examination only. An ultrasound scan or a CT may be needed to confirm the diagnosis, and to get more information about the size and the contents of the hernia. Can an incisional hernia cause complications if it is not treated? It is difficult to predict whether an incisional hernia will cause problems if it is not treated. As with any hernia, there is risk for bowel obstruction and strangulation. The extent of the risk is different from person to person. For most people, it is advisable to have the umbilical hernia treated in order to avoid complications later. What is the treatment for an incisional hernia? The treatment for an incisional hernia is an operation. This is called incisional hernia surgery. The operation can be done in two ways. 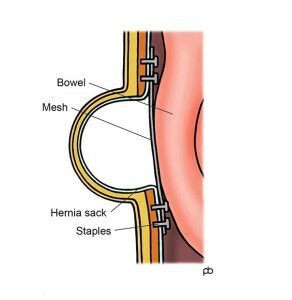 One way is traditional surgery through a cut directly over the hernia. This is called open incisional hernia repair. 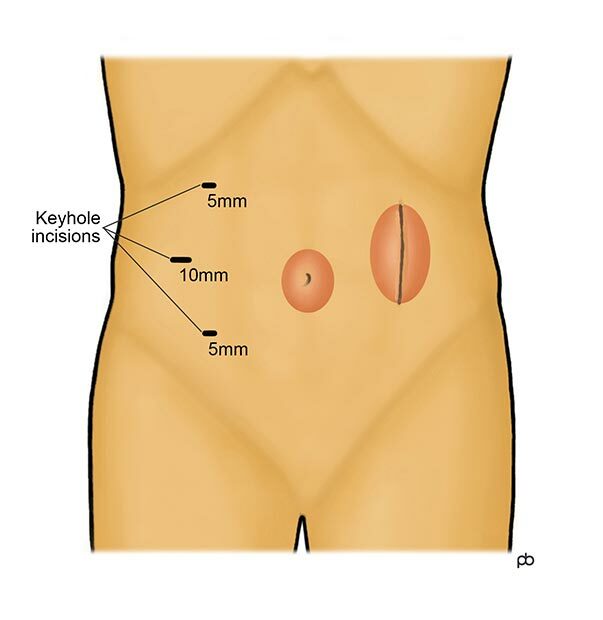 The alternative is to do the operation by keyhole surgery, through small cuts that are placed away from the hernia. This is called laparoscopic incisional hernia surgery. Mr Sarela recommends laparoscopic surgery for most patients with an incisional hernia. Laparoscopy has many benefits over traditional open surgery. Laparoscopic surgery avoids cutting through the scar tissue from the previous operation because the keyhole cuts are made away from the hernia. But, open surgery may be better if the hernia is very large or very small. Ultimately, the choice between open surgery and laparoscopic surgery will depend on your individual circumstances. How is a laparoscopic incisional hernia operation done? A laparoscopic incisional hernia repair operation is done under general anaesthesia. 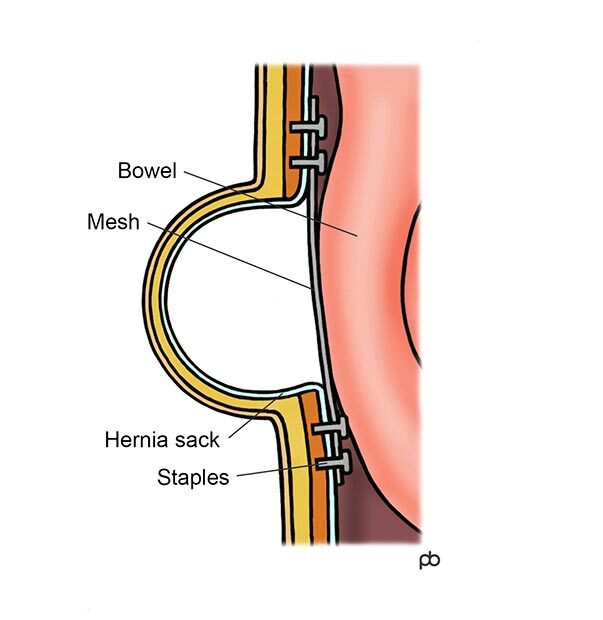 On average, the operation can take 1-2 hours, depending on the size of the hernia. 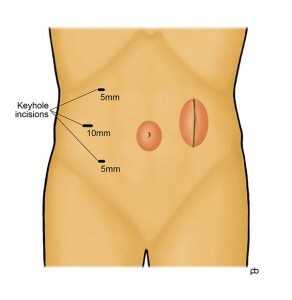 Usually, no more than three keyhole-sized cuts (half-an-inch or less) are made on the left or right side of the tummy, away from the hernia. Any fat or bowel in the hernia is brought back into the abdomen. The fat and bowel can be stuck within the hernia, because of adhesions. Sometimes, adhesions can be extensive and quite a lot of work may be needed to cut the adhesions. A special type of mesh (called a composite mesh) is placed underneath muscles. The mesh is fixed to the muscles using stitches and surgical staples. The keyhole cuts are closed with dissolvable stitches. The hospital-stay will depend on size of the hernia and the complexity of the operation. Most people need to stay in hospital for one or two nights. How is an open incisional hernia operation done? An open incisional hernia repair operation is done under general anaesthesia. A cut is made directly over the hernia. The hernia is separated from the gap in the muscles, and any fat or bowel is placed back into the tummy. The fat and bowel can be stuck within the hernia, because of adhesions. Sometimes, adhesions can be extensive and quite a lot of work may be needed to cut the adhesions. A mesh is used to reinforce the muscles. The mesh is fixed to the muscles by stitches. The hospital-stay will depend on size of the hernia and the complexity of the operation. What are the risks of incisional hernia surgery? Like any operation on the abdomen, there is some risk of bleeding and infection. A serious risk is injury to the bowel during separation of adhesions within the hernia. Rarely, the injury may not be visible during the operation, because it is hidden by adhesions, and can cause serious infection (peritonitis). After the operation, clear fluid can collect in the space that was occupied by the hernia. Such fluid collection is called a seroma. A seroma gives the impression of a lump in the area where the hernia existed previously, and it can raise concern that the hernia has recurred soon after the operation. Seromas almost always settle with time because the body absorbs the fluid, and no treatment is needed. You may get chronic pain in the area of hernia repair operation. The hernia can come back (called recurrence of the hernia) after an operation. The risk of recurrence depends on many factors, such as the size of the hernia, surgical technique and co-existent medical conditions. On average, the risk of recurrence is about 10%. The recovery depends mainly on the size of hernia. Incisional hernia repair operations can be quite painful. Generally, the smaller the hernia, the faster the recovery. Some people will recover quicker, and others may take longer. It is best to avoid strenuous physical activity for several weeks after the operation. There is no hard and fast restriction on physical activity. It is mainly common sense. Do only what you feel you are able to do, and avoid activities that cause discomfort or a feeling of strain in the area of the operation. What is a recurrent incisional hernia? A recurrent incisional hernia is a hernia that has come back (recurred) after one or more operations to fix the hernia. 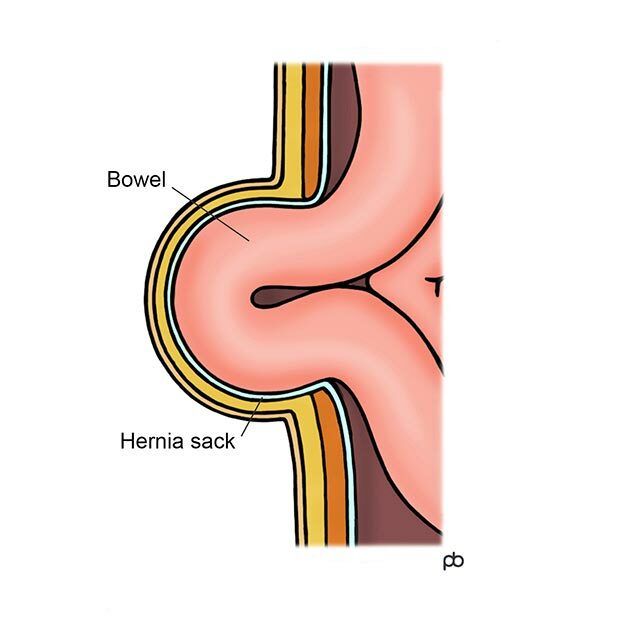 Every hernia repair operation carries some risk for recurrence. The risk of recurrence after the next operation is greater than the risk for the previous operation.